I’m all in favor of volunteering. It brings you free access to plays and concerts if you do your gig at a theater, and that good feeling of being of service to others or actually saving lives if you help out at your local food shelf or a Red Cross blood drawing. But what about being a recipient of others’ volunteer efforts? I live on the outskirts of a small country town at the end of a long driveway off a dead end road. Still, the long arm of volunteerism reaches me right in my yard, in and out of my vegetable and flower beds. Each volunteer brings something to the table or medicine cabinet. 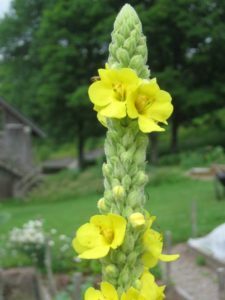 My tallest this year was a huge mullein plant, smack in the middle of my beet and chard bed. These skyward plants always remind me of statuesque menorahs as the summer progresses. Their yellow blossoms can be plucked and dried, then steeped in olive oil with garlic. The resulting fragrant oil soothes and heals ear infections. My daughters, mothers now, know they can still call me to borrow the bottle of oil I keep in the refrigerator door. They also pick the flowers when they see them and bring them to me, a health care premium they can easily afford. Shepherds’ purse reminds me that I never managed to fulfill my dream of becoming a midwife. Even though I no longer have the physical stamina to endure the long unpredictable hours of this calling, I make a tincture from this rosette-based plant with tiny triangular purses of seed spaced along its stems. Its strong rank smell alerts us to the importance of the job it does in helping to stop post-partum bleeding. I’m satisfied to know it’s in the kit of my local midwife and she can call me if she needs more. 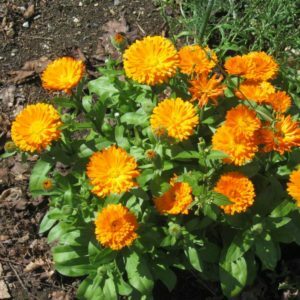 One year I planted calendula, with its happy orange disk-shaped flowers. Never again have I had to put a calendula seed in the ground. They pop up cheerily every year and everywhere in my garden, a helper in keeping harmful insects away from my veggies. The salve I make from them keeps skin soothed and supple, and is also good for bruises, burns and sores. A sprinkle of fresh calendula petals adds a happy edible confetti to any summer salad. The most surprising guests this year, though, were several nicotiana plants. I don’t remember ever planting one of these in my garden, but they obviously came from somewhere. Their leaves are a strange combination of sticky and hairy. Once they send up their flower stalk, the most wonderful perfume drifts out of their dangling flowers, especially in the cool of the evening. I know of no practical use for this lovely plant at the moment except as a vehicle for memory. 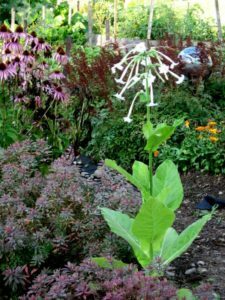 Before I knew nicotiana needed bright sunshine, I grew one from seed in the house one winter. Its weak stems reached out towards the meager winter sun. It grew long and leggy, but it still bloomed. My long and leggy step-daughter, still alive then, came home for a visit and noticed it right away. “Oh, I love it!” Etta said, as she lightly stroked that red-blossomed ridiculously living, ridiculously reaching plant.